Yuengling Light Mild Wing Sauce – Yuengling is a very ‘Pennsylvania’ thing; some of my favorite memories of my year out there included stopping by Smokey Bones after work to have a ‘lager’. Janelle couldn’t locate the hot version, but she sent me the mild, which will still be just as delicious. This is going to be perfect for Superbowl Sunday! Urban Detox (Goji Berry flavor) – This stuff is great for hangover prevention & remedy. A must-have for mornings after having a few beers at trivia. Which, may I add, are on school nights. Cadbury Mini-Eggs – I love these at Easter! They’re one of the ‘treats’ that I put off eating until very last, because they’re one of the best. 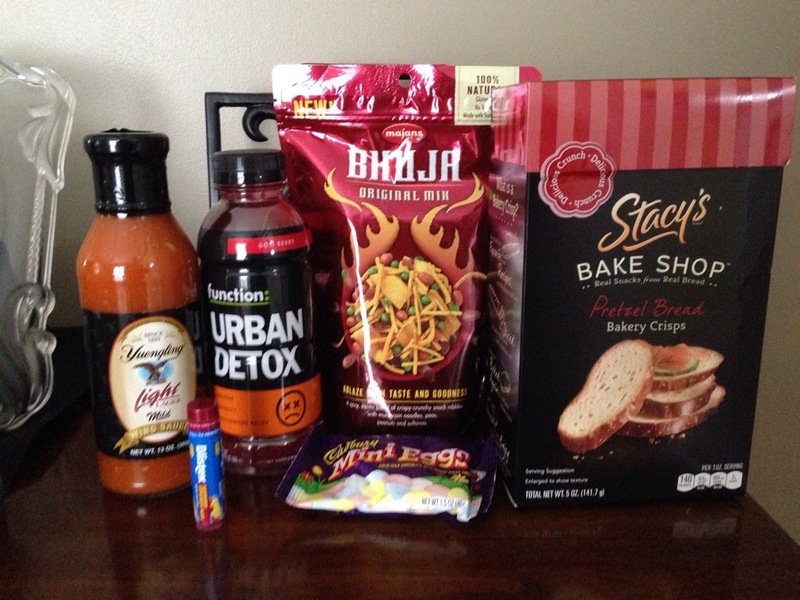 Stacy’s Pretzel Bread Crisps – I only haven’t tried these yet because of Superbowl Sunday. But, it’s no secret that I love crunchy snacks, especially pretzels. Now I just have to figure out exactly what I’m making with them.